Joy De Vivre Design: Looking for an Easy to Cook Snack? While relaxing on a Sunday afternoon there is nothing better than watching your favorite television show and having a tasty snack. Unfortunately with all of the salt, sugar and fat grams....many of our go to goodies leave us with a mound of guilt. 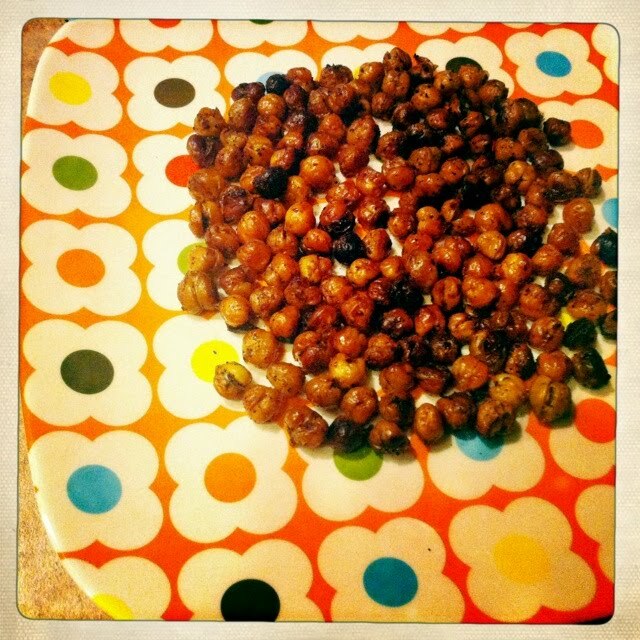 Thanks to the South Beach Diet I have found my new favorite, and much more healthy, snack- Roasted Chickpeas. They are so easy to cook and are low in fat, yet high in protein. 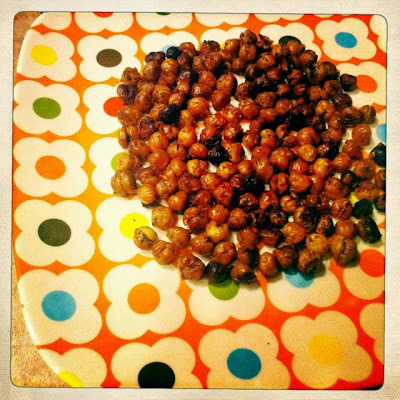 The version in the South Beach Diet cookbook calls for just plain chickpeas, but after doing a few Internet searches I found there are many options for roasting chickpeas. Come to find out they are quite the popular treat in other parts of the world. After trying a few of the different recipes I have found my favorite to be the chili-lime chickpeas. 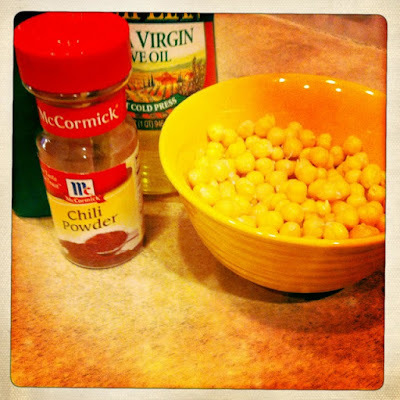 You will need a 14-19 ounce can of chickpeas, lime juice, olive oil and chili powder. 1. In a strainer pour a can of chickpeas. Rinse with warm water. The outer shells will start to peel off. Remove the shells that are loose as that will help them to cook better. 2. Pour the chickpeas in a bowl. Pour in equal parts of lime juice and olive oil, just enough to evenly coat the chickpeas. Sprinkle on chili powder. Let them sit for about 30 minutes to absorb the flavor. 3. Preheat the oven to 350 degrees Fahrenheit. On an ungreased baking sheet place the chickpeas in a single layer. Bake for about an hour, but check them periodically. Depending on your oven the timing may be off slightly. They will be ready when they are crispy brown and rattle when you shake them, (that sounds silly now, but trust me it makes since when you cook them). The finished product tastes something like a Corn Nut. Oooh, that looks yummy! I'll have to give it a try!